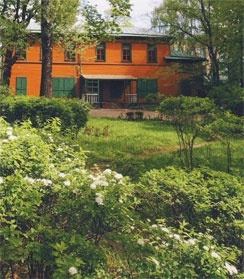 Near the centre of modern Moscow, though a place which a hundred years ago was in the country, there is a cozy little home-estate which was once owned by Leo Tolstoy. In the first half of the XVIIth century, the area near the bend of the river Moscow where the house stands, was called Hamovniki. The word is derived from the Russian word “ham”, which in old Russian language meant flax. It was here where weavers moved in a special settlement called “Hamovnaya Sloboda”. They were called “hamovniki”. The latter part of the XVIIth century was marked by considerable increase in demand for Russian flax. On the order of Tsar Mikhail Fedorovich Romanov (1596-1645) hundreds of weavers migrated from Tver to Moscow. Here they were granted special status: the taxes they paid were low, they were excluded from some obligations, but they were bound to live only in Hamovnaya Sloboda and nowhere else. The house in which Tolstoy later lived, was built at the beginning of XIXth century by Ivan Meschersri. The estate changed hands many times. Lev Tolstoy bought the house state from councillor Ivan Arnaytov in July 1882. 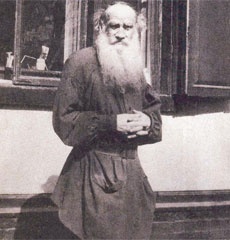 Tolstoy’s older son Sergei later recalled, “Tolstoy liked very much the solitary position of the house and its neglected orchard, with its woods.” When, in April 1882, Tolstoy visited Hamovniki to look at the estate, it was late evening, and the owner said with great anxiety: “Lev Nikolaevich, you will see nothing because of the darkness!” “Don’t worry about the house. No need to see that, I am here to look at the orchard!” replied Tolstoy. Tolstoy considerably enlarged the house by adding three rooms on the upper floor and a front staircase. As a result, the house looks rather strange: un-proportional, a bit angular, but interesting and not easy to forget. There are small windows on the longer side of the house which can be seen by looking through the carved fence from Dolgohamovnichei street, now renamed Lev Tolstoy street. The opposite side of the house, which looks out onto a garden, is more picturesque. It has a large terrace with ornamental balusters, three windows, and the high windows of the upper front halls beautify the view. There were two entrances into the house—the front door and the back door. When Tolstoy lived here, there was no electricity, no water supply system, and no sewerage system in the house. 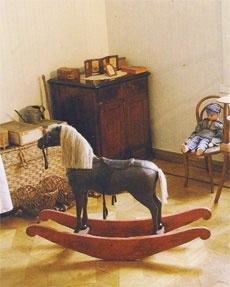 Almost all the furniture in the house was selected and bought by Tolstoy. On the ground floor there were a diningroom, a bedroom and children’s rooms. A large front hall and two living rooms were situated on the added upper floor. 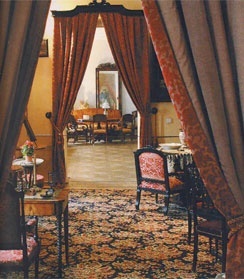 Tolstoy’s rooms were in the old part of the house, which are well preserved and remained the same as they were at the beginning of the XIXth century. Tolstoy’s youngest daughter Masha wrote: “My father’s study room, situated in the remote part of the building, was rather peculiar. The ceiling was so low that you could rest your arm on it. There was upholstered furniture, covered with a black rubber sheet, a sofa, wide armchairs and a big writing desk with ornamented legs. It was so calm there, no city sounds or children’s shouts reached penetrated inside”. Even when it was dark, late in the evenings, Tolstoy lit only a single candle. He was short-sighted, but he adamantly refused to wear glasses and was proud of this. To be able to read his texts, Tolstoy shortened the legs of his chair. When he tried of sitting in his chair, he would move to the writing stand by the window. All of these pieces of furniture can be seen today—everything in Tolstoy’s study and work room is preserved exactly as it was when he was alive. The garden at the back of the house, was usually full of life. When it was warm it was used for playing crocket, and in the winter it was used as an ice ring. A special hill for sleighing and playing when the snow fell was created at a remote part of the garden. In spring and autumn, family and guests liked to drink tea in the garden pavilion. Here at Hamovniki, Lev Tolstoy and his family spent twelve winters—from 1882 to 1901. It was here that his last daughter Alexsandra was born in 1884, his son Alexei died in 1886. And here Sofia Andreevna, Tolstoy’s wife, gave birth to their last child--Vanechka, who died at the age of six. The house has become one of Moscow cultural centres. Tolstoy wrote here about one hundred of his works, including such masterpieces as “The Death of Ivan Ilyich”, “The Kreutzer Sonata”, “Resurrection”, “The Power of Darkness”, “The Living Corpse” and others. The year after the his death in 1911, his wife Sofia sold the Hamovniki home estate to the Moscow town council. In 1920 the house and the land around it was nationalized and restoration work began. In November 1921 the Tolstoy museum opened its doors to the public for the first time. 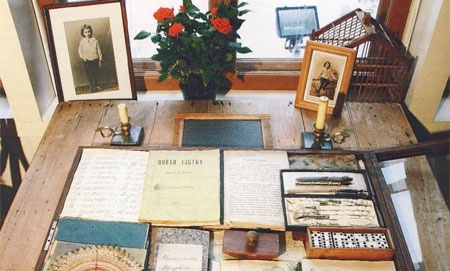 The house contains about 5,000 artefacts once belonging to Tolstoy and his family.